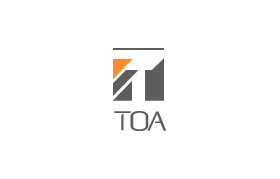 TOA Electronics is dedicated to the development, manufacturing and distribution of premier audio and security products. TOA Corporation was founded in Kobe, Japan over 70 years ago. All of TOA’s products bear its name. TOA Electronics operates in over 100 countries worldwide, with more than 1500 employees and sales greater than $300 million dollars. TOA manufacturing facilities are found in nearly every major market area. These facilities have a reputation for precision design and fabrication, resulting in a proven track record of TOA product reliability. TOA’s extensive line of audio products includes amplifiers, speakers, mixers, wireless microphone systems, digital processors and network audio. domain value . Security products include CCTV cameras, DVR’s and integrated intercom systems used in security and communications applications.